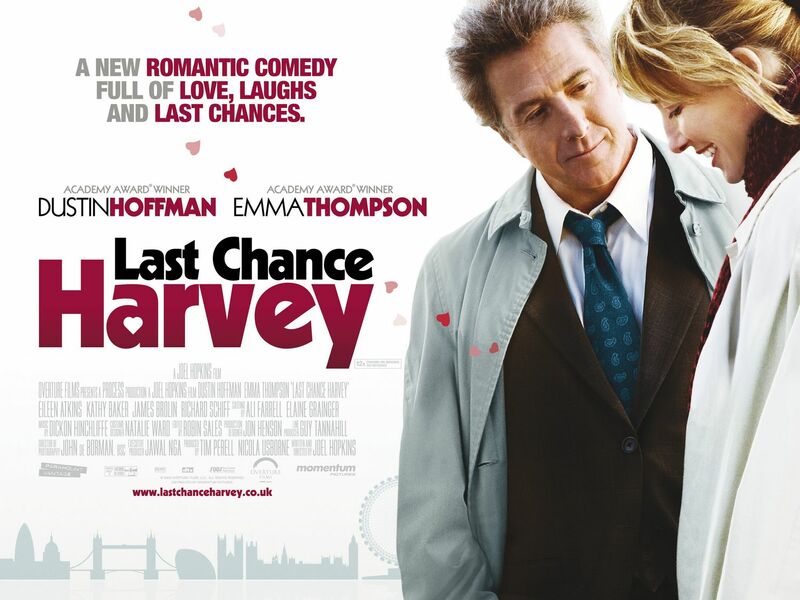 An undemanding but still mostly successful and at times moving romantic drama, Last Chance Harvey gets by on the lovely rapport shared between stars Dustin Hoffman and Emma Thompson who breathe a layer of maturity and emotion to the piece. Harvey Shine is a jingle writer who has seen better days. Lately, his job has become numbing but he still slaves away as it is his way of income. Yet his output of late has caused his employment to hang by a thread and his boss warns him that he has only once chance left to prove himself. Travelling to London for the wedding of his daughter, Harvey feels further alienated when he finds out his daughter wants her stepfather to give her away. Granted, Harvey’s relationship with his daughter has been strained since his separation from her mother, but he still feels devastated by this information. Leaving the ceremony to avoid any further embarrassment, he rushes to the airport to catch a plane home. He misses the flight home and is subsequently informed that he has been fired from his job. He meets airport worker Kate while drowning his sorrows in the bar. She is a woman who has all but given up on love, and is unwilling to try it again. Kate pours her energies into supporting her elderly mother, who is paranoid and always pestering Kate over why she doesn’t have a man in her life. Bonding over their respective lives and what they want out of it, Harvey and Kate develop a mutual and unexpected attraction that they believed wouldn’t touch them at this time and can promise them another chance at companionship. Joel Hopkins does a decent job directing, though he doesn’t quite have a real style or calling card to stamp his name. It’s in his screenplay that warmth and pathos come, despite the sidestep into mawkish territory on occasion. Often, Last Chance Harvey can lurch between humour and comedy without much of a pay off, which could have been rectified with more substance. And while that stuck out at times, there was a level of sincerity and honesty to the screenplay that compensated for the flaws. I think my biggest niggle with the film was that it could have had a lot more going for it story wise. I mean, I did enjoy the wistful and soul-searching parts of the friendship that blossomed into romance but I felt there should have been a little bit more drama to buttress things. I’m a guy who enjoys gentle and autumnal like the best of them, and I really found myself enjoying quite a bit of the chemistry between the great actors present. Just a tad more life and a bit of something else sprinkled on would have made the film really excellent. As it stands, Last Chance Harvey loses some points for flagging interest yet gains just as many by finding pathos in the ideas of two middle-aged people discovering a love they thought had left them long ago. It’s refreshing to see a movie deal with attraction between people in middle age, most romances seem to favour the youth formula. The depth of the film comes from the fact that these two characters are older and wiser, but still relatable and looking for something more. When the humour and drama hit, they hit very well and raise Last Chance Harvey to a better level that while still flawed, has its heart in the right place. The movie is the equivalent of an old blanket, it has its wrinkles and though this is the case, you find it reassuring and stirring. Last Chance Harvey’s biggest impact comes courtesy of two stunning performances from Dustin Hoffman and Emma Thompson. As the worn out and awkward man who feels a deep void of loneliness, Dustin Hoffman is quietly nuanced and touching, while bringing some bumbling humour to it too. Emma Thompson gorgeously plays the woman who makes an impact on him unexpectedly, with a natural and lovingly observed sense of cautious longing and warmth. It’s pleasing to see them act opposite each other and bring out the respective best each has. These two professionals share a beautifully unaffected chemistry that overcomes any clichés the script offers up, and succeed at saying more with just a glance or a smile than most actors can with tons of dialogue. Eileen Atkins offers up some really good humour as the dotty mother, convinced that something fishy is going on around her when it’s actually quite the opposite. While Atkins has a good time in the supporting role, James Brolin and Kathy Baker are handed one-note characters who don’t particularly contribute to the story is any real way. It is not a film that has much in the way of fresh ideas or a clear-cut idea of where it’s going which is often too it’s detriment. But the moving and natural work from the main actors and a sometimes bittersweet look at people discovering possible love in middle age, Last Chance Harvey is gentle and has clout that makes it a sweet and heartfelt ride. See it for Hoffman and Thompson. A delightfully rendered coming-of-age story based on a memoir by Lynn Barber, that captures its setting excellently and has both humour and seriousness in it, An Education encompasses something very charming and bittersweet. It is 1961; Jenny Mellor is a bright, pretty and sheltered 16-year-old girl living in Twickenham, London. Her parents, mainly her pushy father Jack, are pressuring her to study hard so she can go to Oxford. Yet Jenny is restless with this and wants to experience something fun and exciting in a world that she sees as very boring. Into her life in a shiny car comes the much older David Goldman. He is a charming and cultured man who despite being almost twice her age, gives Jenny a lift home when she is caught in rain. Jenny is completely bowled over by the handsome stranger and becomes dreamy about him. As he begins to show an interest in her, Jenny’s plans for Oxford are put on hold and slide away as she immerses herself in the glamorous world that David offers, where she meets his friends partner in crime Danny and his oblivious girlfriend Helen. Yet David, while able to please everyone around him including Jenny’s parents, is clearly up to something that puzzles Jenny. It seems the journey for her is going to leave her with two choices. Is the cosmopolitan lifestyle that Jenny has become immersed in, thanks to David, really worth sacrificing a place at Oxford for? And just what will come from the relationship with David, who is clearly not all he seems? Danish director Lone Scherfig’s largely unfussy but very personal direction explores the social mores of the time, when you can just about feel that big changes in the world are literally just around the corner. She places us in the story and we witness like Jenny, the chance of escape into something that looks so thrilling, but could very well be the opposite. The script by Nick Hornby combines humour with the burgeoning drama, in an effortless an understated manner. And while most of the exercise is very charming and apparently light, underneath it and emerging is the seriousness that rightfully connects with us as the glamorous world that we see may not be all it is cracked up to be for Jenny. Because of this, a bittersweet harmony between the fun and the moving is crafted with adroit skill and An Education soars in its evocation of this young girl’s journey that brings her both happiness and sorrow. An Education wisely sidesteps becoming overly nostalgic and mawkish, thanks to the greatness of everyone involved with the project. It is a credit to the film that the central part of Jenny falling in love with David and being taken in by him is not viewed as creepy or seedy. Sure the character of David is a little sleazy, but the relationship shared for the most part stays on the right side of curious and a little poignant, without the need to become tawdry. The representation and recreation of the early 60’s before it was swinging is beautiful in construction and really shows a glamour that is to Jenny what she has been searching for. Some of the action sags in the middle part, but is quickly redeemed by the moving examination of Jenny’s journey that captures your attention with its naturalness and believability. 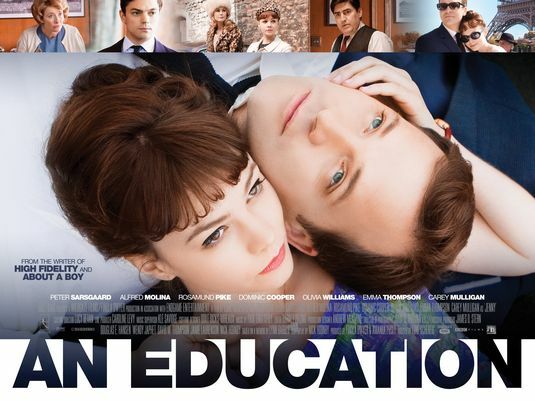 The glowing and beating heart at the core of An Education is the stunning work from Carey Mulligan. She boasts something akin to Audrey Hepburn with the playfulness and innocence she projects in the part which is simply magnificent. But Mulligan also displays that Jenny is smart(sometimes a little too smart for her own good) and clearly no fool, she just craves a sense of something extraordinary which I’m sure even now is something that a lot of teenagers can relate to. Jenny just wants some fun and adventure in her life so it isn’t really surprising that she is so taken in by David and the glamorous life he leads her into. Carey Mulligan sells everything about the character so subtly and beautifully that even when the character of Jenny is making decisions that in the long run may be bad, we can see why she is doing it and the reasoning. This was a star making performance from Carey Mulligan, who since this film has become one of my favourite and most reliable actresses. Surrounding Mulligan is an outstandingly assembled cast of greats who contribute something to each of their respective parts. Peter Sarsgaard strikes the right balance of smooth talking sophistication and a lingering sense of darkness, though like Jenny the effectiveness of the performance lies in how he takes people over, not least the audience. Dominic Cooper plays David’s right hand man, who while still a charmer offers Jenny support and foreshadows what David may truly be like. Rosamund Pike is a hoot as the fashion plate bimbo with all the eye rolling and hysterical lines to match. Case in point after hearing that Jenny scored a B on her Latin exam, she exclaims ” Someone told me that in about 50 years, no one will speak Latin, probably. Not even Latin people.” It is amusing comic gold to watch. The always good Alfred Molina turns in a finely tuned performance as Jenny’s domineering, penny-pinching father, who is actually just looking out for his daughter’s needs. He is both an amusing and melancholy character, who wants to be there for his daughter yet due to his old-fashioned attitudes is puzzled by her at the same time. Cara Seymour ably supports Molina as his wife, who is always trying to quell disagreements in her household. Olivia Williams is on hand for a moving delivery as the inspiring schoolteacher who gives Jenny some very strong advice in helping decide her future. Emma Thompson has a ball with her small role as the disapproving headmistress, who doesn’t take too kindly to Jenny’s plans to leave school for an older man. A charming but very observant picture of teenage curiosity and the heart versus the head, An Education provides a well mounted picture of a certain time and a beautiful performance from Carey Mulligan.